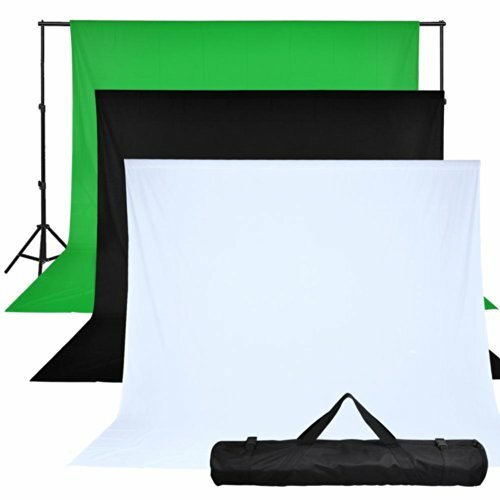 10' Adjustable Background Stand Kit with Chromakey Screen Muslin Black White Backdrop 10ft X 10ft by AW at Marco Marcucci. MPN: AW-BSD000013. Hurry! Limited time offer. Offer valid only while supplies last. * Professional Background/Backdrop Support: Strong alloy steel construction. 8-1/5 ft Max. fully extended height and 2-2/5 ft Min. height. Fit for both fabric (canvas/muslin) and paper backgrounds. Valued $14.99 at market price! Suitable for one set of background support. One 10ft x 10ft Large Black Muslin Backdrop. One 10ft x 10ft Large White Muslin Backdrop. One 10ft x 10ft Large Green Muslin Backdrop. The most popular and indispensable backdrops for your photo studio. Professional 10'x8-1/5' Telescopic Photo Backdrop Support Kit with three 10'x10' Large Backdrops! !